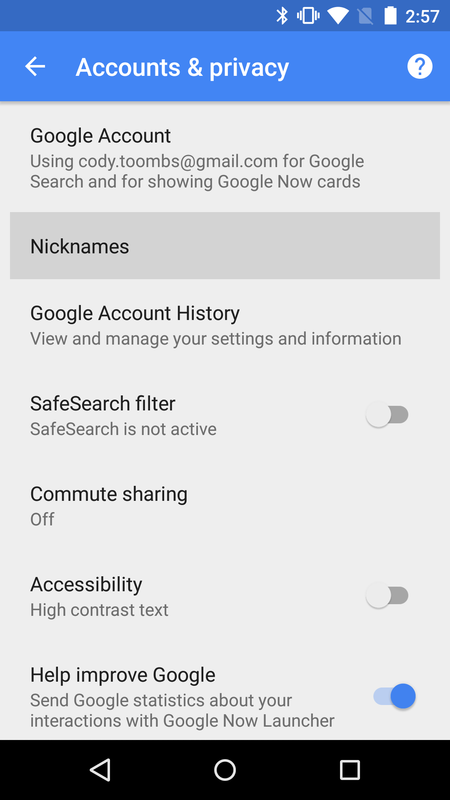 If you were one of the many users that didn't already have a Nicknames in the Accounts & Privacy settings screen, this update probably enabled it. At nearly a year old, it's strange that so many people are only just now seeing it, but it may have only appeared on an account if a nickname had been created. It's not clear if everybody is getting this option, especially since Google's support article still specifies that it's limited to English speakers, but it's certainly appearing for a lot of people. 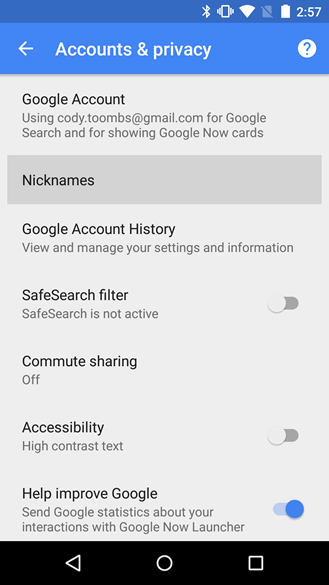 Trusted Voice first appeared as a Smart Lock feature about a month ago with the release of Google Play Services 7.0, but it was removed shortly thereafter. At the time, tapping on the option to configure Trusted Voice would launch into the Google App settings screen, but didn't offer any way to actually use the feature. 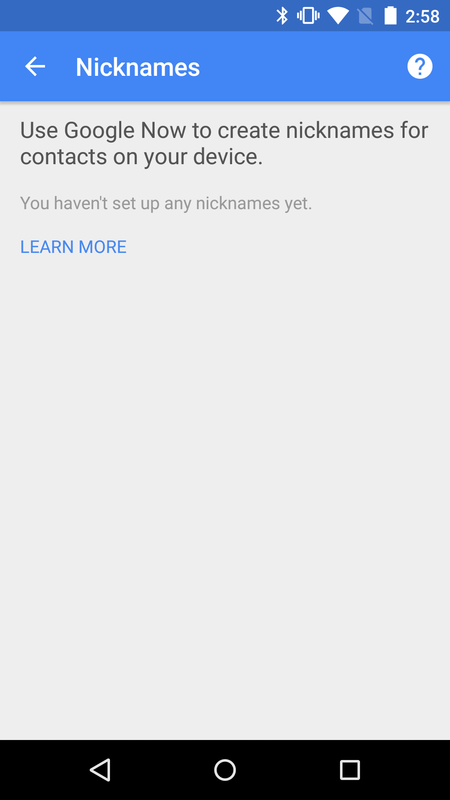 It looks like the missing functionality is now making its way into the Google App, as new strings have turned up that will be used in the configuration screen for the new feature. The text in the second string makes it abundantly clear that Trusted Voice is not considered a secure mechanism for locking a phone. This warning is almost certainly meant to prevent the same complaints that were made about Face Unlock when it first appeared. It's hard to be sure, but it looks like the necessary bits are in place for Trusted Voice to launch. It's possible Google will turn it on remotely, as it has with so many other features, or we may still have to wait for more updates. 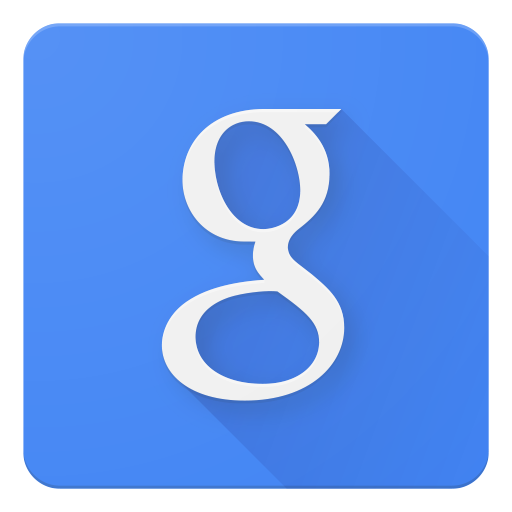 Google will probably post something to Google+ when it's ready, or the feature may just appear one day with no warning at all. We'll just have to keep watching. Appearing for the first time, a new experiment named 'seamless hotword' seems to be in testing. For now, the only footprint for this feature is an inaccessible settings screen with a single toggle. There are two strings used on this screen, the first being a section title that reads "Internal Only," and then the title for the setting, which is just called "Seamless Hotword." For now, it looks like these are just placeholders for something Google is working on privately. We'll keep an eye out for this in future updates.